Hugh Jackman may have lost out at the latest Oscar ceremony, but the big screen star of Les Misérables has been a longtime winner when it comes to love, thanks to Deborra-Lee Furness. The pair, married since 1995, probably wouldn’t have met if not for a class he took in college that started his road to superstardom. Born in Australia in 1968, Jackman wasn’t into acting as a child, though he did appear in a stage production of “My Fair Lady” in high school. In college, he studied communications, but in his last year he took an acting class merely to get enough credits for graduation. But that class, which included Jackman snagging the lead in a play, influenced him to become a full-time actor. Meanwhile, Furness, also an Australia native who was born in 1955, saw her future earlier, and headed to New York, where she graduated from the American Academy of Dramatic Arts in New York in 1981. Her career was in full swing when she took a role in the 1995 Australian TV series, Correlli. It was on that show where Jackman got his first break—and fell in love. Fate almost lost out to Furness’ rules for dating, which she made the year she and Jackman met. She promised herself not to date any more actors, or to date anyone younger than 30. A year after meeting the two were married. Some tough times followed, however, as Furness suffered two miscarriages. The pair, determined to be parents, adopted two children, Oscar Maximillian, born in 2000, and Ava Eliot, who was born five years later. Though Furness works less these days, spending more time on charitable work, Jackman continues a breakneck schedule. 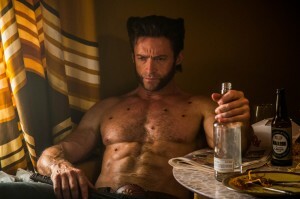 His latest turn as superhero Wolverine in the next X-Men: Days of Future Past movie comes out this week. Still, he considers Furness and their children his top priority. When he won the Best Actor in a Musical or Comedy Golden Globe for Les Misérables, he thanked Furness for convincing him not to drop out of the movie after a hard day of rehearsal.